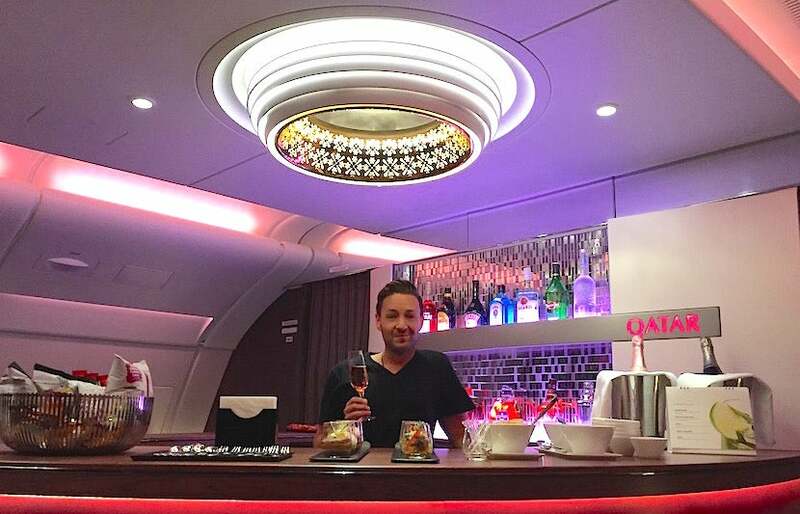 I recently flew on Qatar’s A380 to see how it measured up against its other phenomenal business-class products. The Pros: Great seats and a beautiful bar at the back of the cabin. The Cons: The larger business-class section made service feel a little less personalized than on smaller planes — and the Wi-Fi didn’t work. 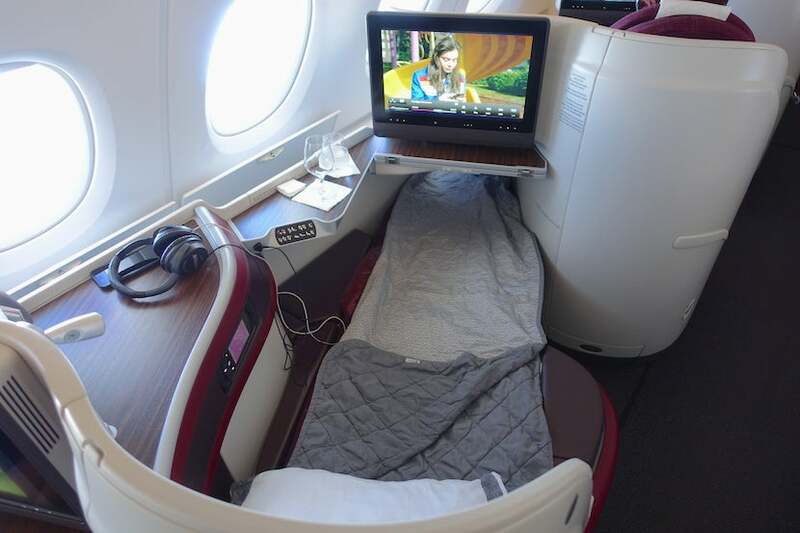 Although Qatar Airways’ new business-class QSuites recently went into service, we won’t be seeing them on too many routes for the time being. 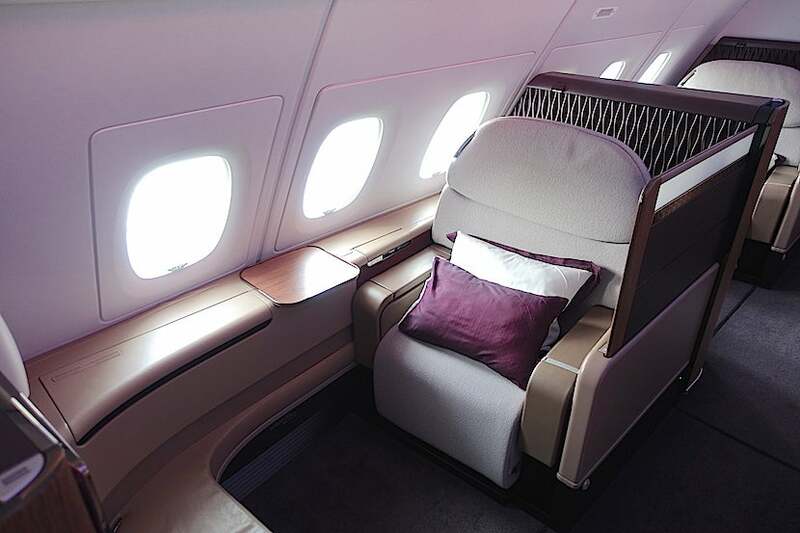 Luckily, the airline already has one of the world’s best business-class seats, which we’ve reviewed on a few of its other aircraft, including the A350 and the 787 (twice). 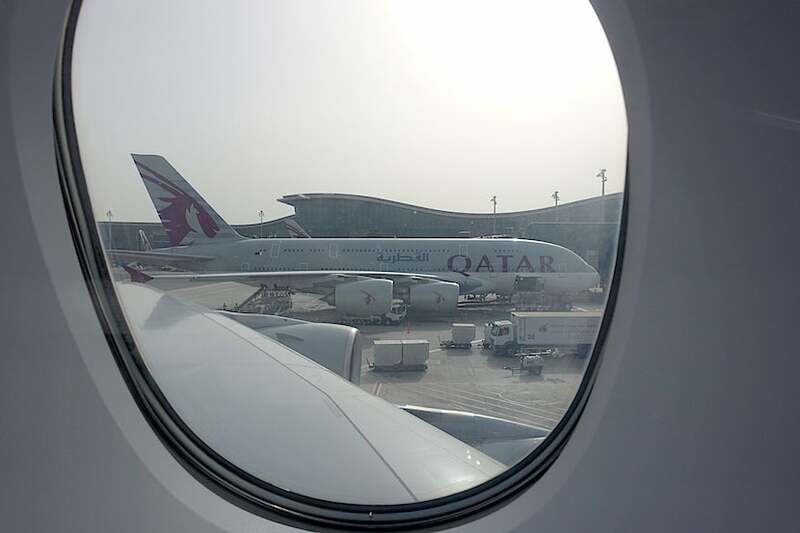 On a recent trip from Europe to South Africa, I had the opportunity to test out Qatar’s business-class product on the airline’s largest plane, the A380. Here’s how it went. Earlier this year, I was plotting out a trip to Africa with a friend — while she was traveling directly from the US, I would be flying in from Europe. 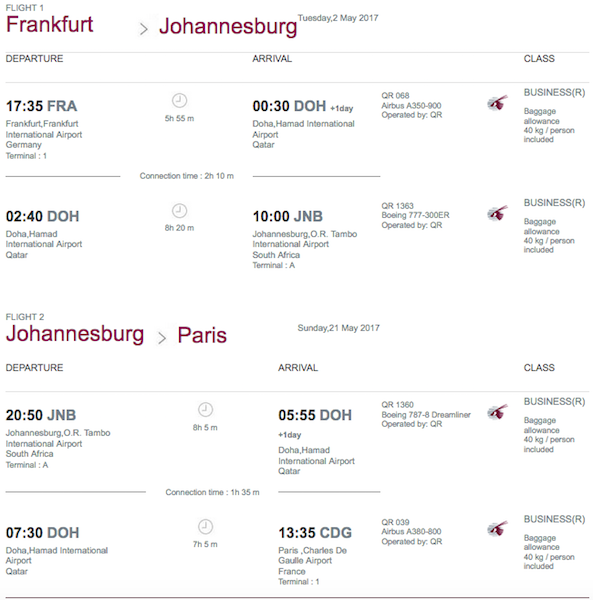 As I looked for airfare and award options, it turned out Qatar Airways was having an amazing fare sale from Europe to Johannesburg, South Africa, and the dates I needed were available. 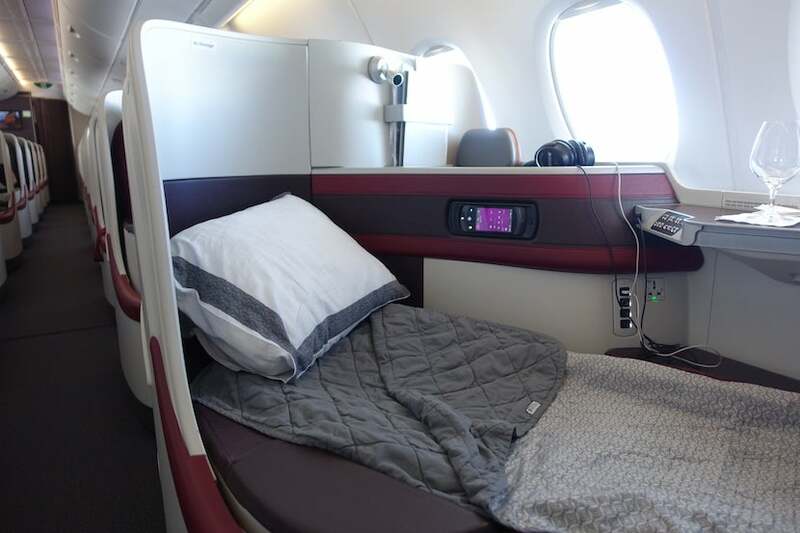 I purchased an open-jaw ticket that would have me routing from Frankfurt (FRA) to Doha (DOH) to Johannesburg (JNB) on the outbound aboard both an A350 and a 777-300ER. 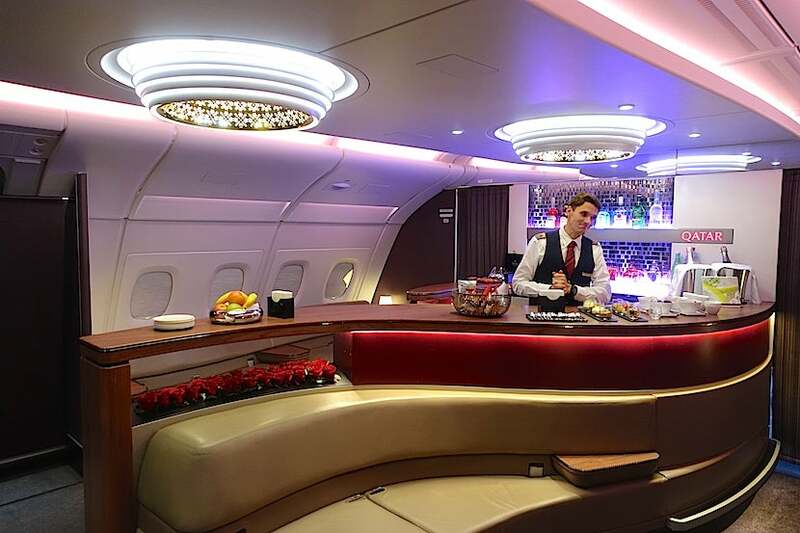 The return trip would be from Johannesburg to Doha to Paris (CDG) aboard a 787 and an A380. 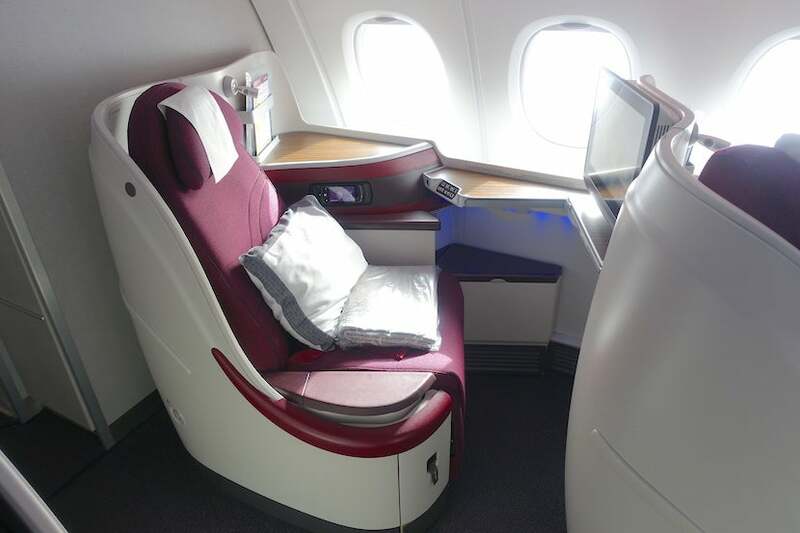 That way, I’d get back-to-back comparisons of business class aboard four of the airline’s primary long-haul jets (which I’ll talk about in another post). So, basically, this was a great way to indulge my inner #AvGeek. 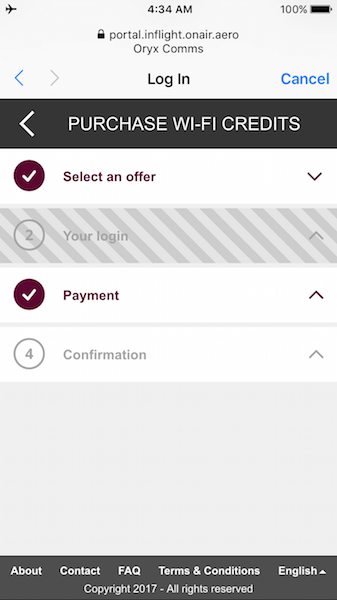 I paid 1,443 euros for the entire itinerary — at the exchange rate back in January when I bought the ticket, that ended up being $1,541, which seemed like a pretty great deal considering it was going to get me about 31 hours in a fantastic business-class product, plus some time at Qatar’s phenomenal lounge in Doha. I used my Chase Sapphire Reserve Card, earning a total of 4,623 Ultimate Rewards points since it gives you 3x points on travel purchases. Qatar is part of Oneworld, along with American Airlines, so that’s where I decided to credit my miles. If I had wanted to book this as an award ticket, it would have cost me a total of 110,000 AAdvantage miles per American’s award chart, which the airline devalued last year. However, given the relatively low fare, I decided to just pay for this R fare class ticket instead. Hypothetically speaking, if these flights had actually been on American Airlines, I would only have earned 5x award miles per dollar on the airfare — I don’t have elite status with them — and two elite-qualifying miles per mile flown. Given that the base fare and airline surcharges were 1,300 euros (which meant $1,388 at the time I purchased the ticket), I would have earned just 6,940 award miles, 27,328 EQMs and $1,388 elite-qualifying dollars. That would have been enough EQMs for Gold status with AAdvantage, but far short of the spending minimum I’d need to hit. 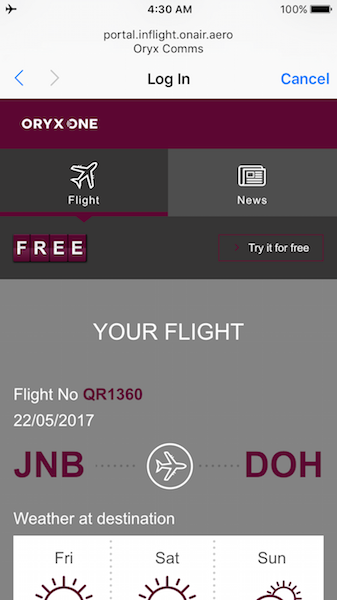 Qatar’s R class tickets earn one award mile and 1.5 EQMs per mile flown, plus 20% EQDs per mile flown with American AAdvantage. Thanks to those earning rates, I yielded 13,664 award miles, 20,497 EQMs and $2,735 EQDs from this trip. While I earned far fewer EQMs, my award-mile and EQD earning were much higher and put me almost to Gold status thanks to this single itinerary — I earned nearly two EQDs per dollar spent on airfare thanks to the fare-class rules, so this is a good strategy to have in your back pocket. Note that because I was flying to and from Europe, I would not have been subject to the US electronics ban at the time. 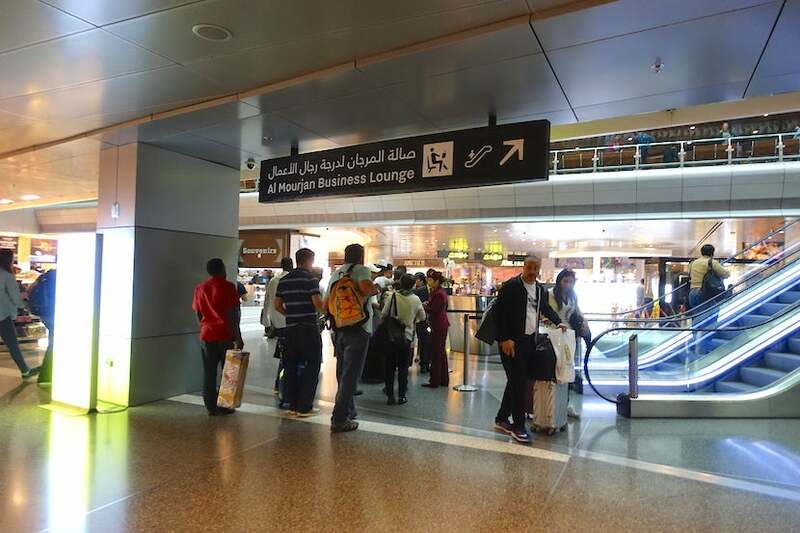 My trip also took place a few weeks before the diplomatic scuffle between Qatar and its neighbors, so luckily, I avoided any inconvenience there. Talk about great timing! 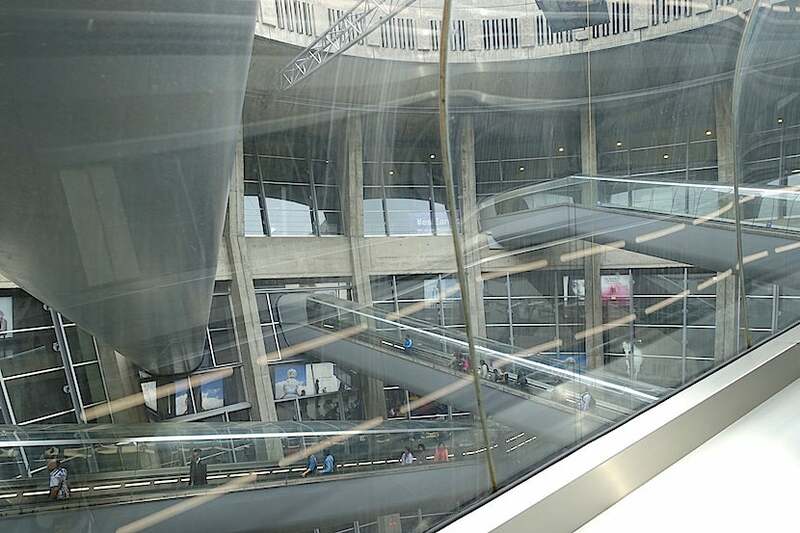 My layover between the flight from Johannesburg and the flight to Paris was just 95 minutes — by the time we got to the gate, I went through a security checkpoint and sorted out where my next flight was departing from, it was already time to start walking over to the new gate. I probably could have stopped by the Qatar Airways business-class lounge, but I would only have had about 10 minutes there. Instead, I went straight to the gate to check in and take some pictures of the plane on the ground. 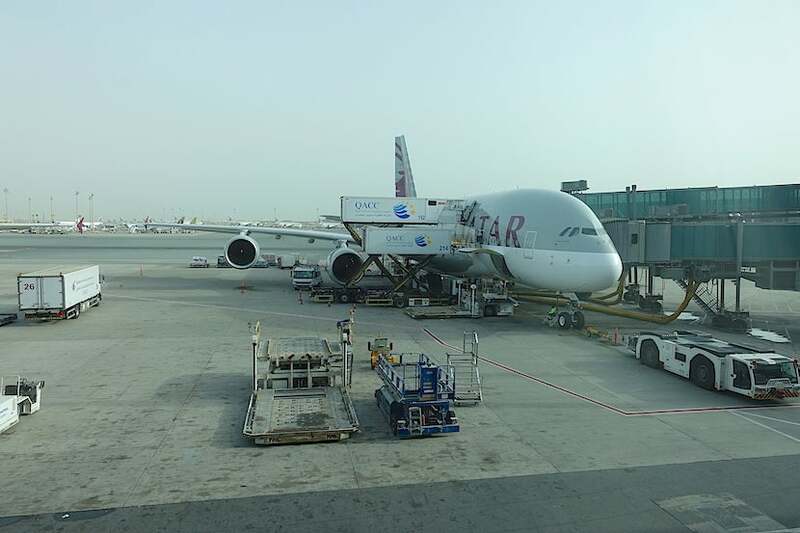 Qatar’s A380 gates were interesting; there was a ground-floor waiting area for the economy cabin. 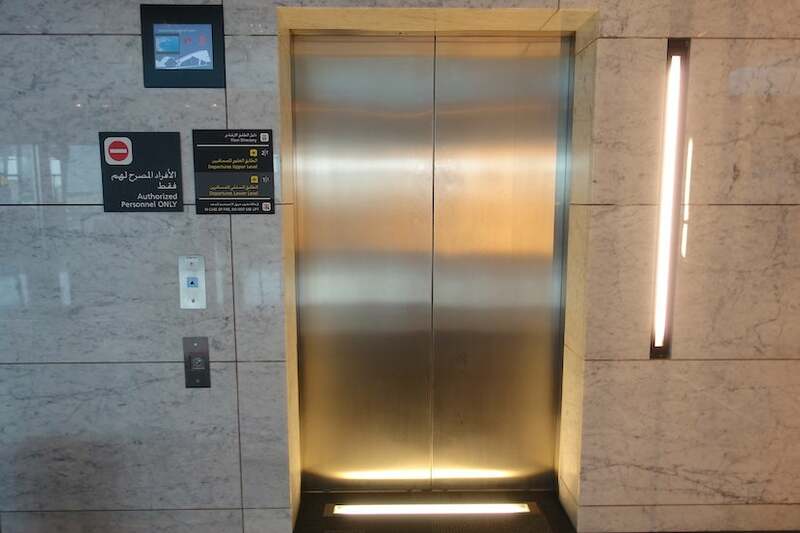 You could also take the stairs or an elevator up to a second-floor waiting area from which you could board the upper deck, where business and first class were located. That’s where I headed, though there were no airline representatives up there and the few of us who were waiting there were a little confused about whether or not we were in the right place. 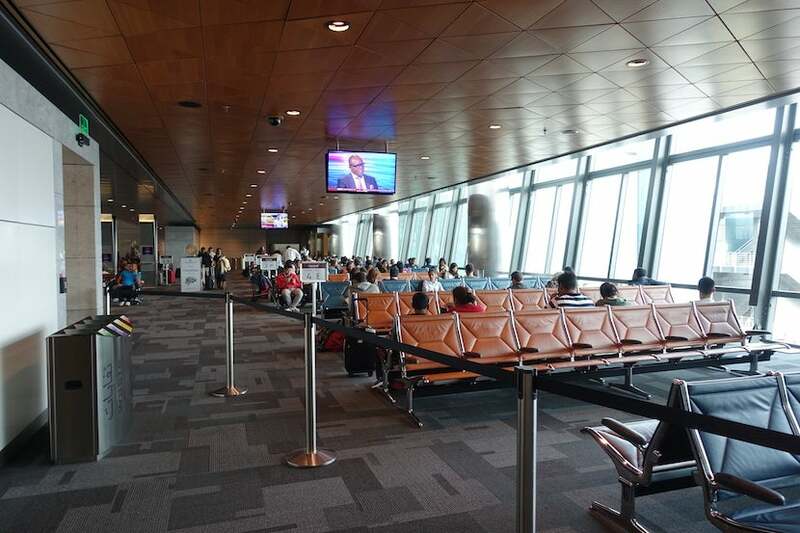 About 45 minutes before our scheduled departure, someone from the airline came up and opened a door at one end of the waiting area, then disappeared without saying anything. Two of the other passengers made a beeline for the door, so I followed them — sure enough, it was time to board. I really wish they’d made an announcement so that this was clearer. That way I might have been first on the plane so I could have taken some more photos! Two smiling flight attendants waited at the door to show passengers to their seats. As I mentioned, although two other passengers had beaten me to the punch, I did manage to get on the plane rather quickly, and started taking photos immediately. 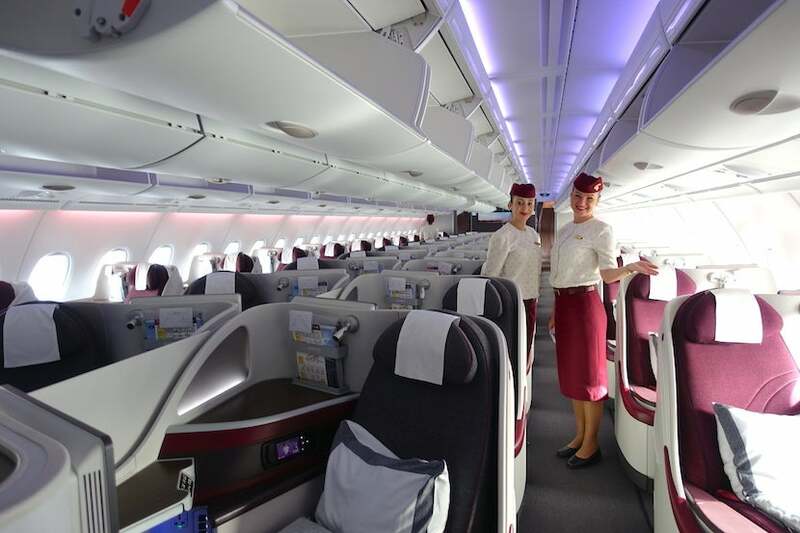 When I explained that I was just excited to be flying on the A380 with Qatar, the flight attendants struck a friendly pose for me. They even told me that since no one was up in the first-class cabin yet, I could go take pictures there if I wanted. 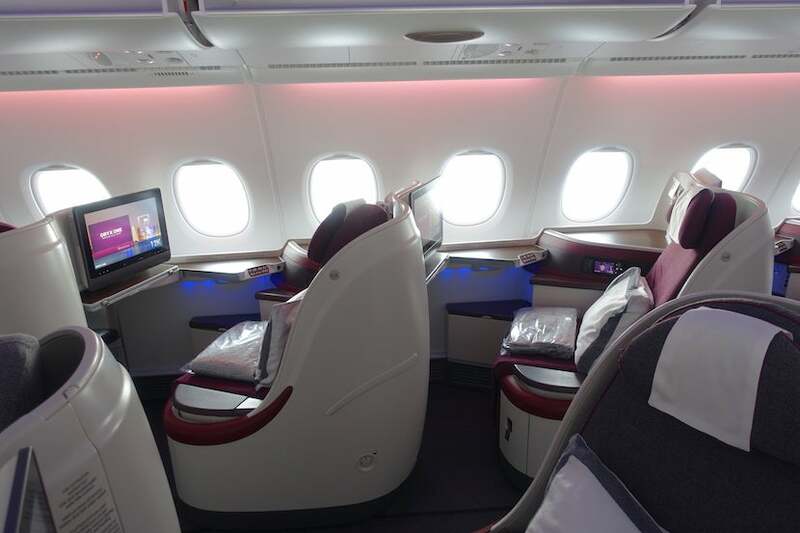 I continued snapping photos of the rest of the business-class cabin and the various seats as well. 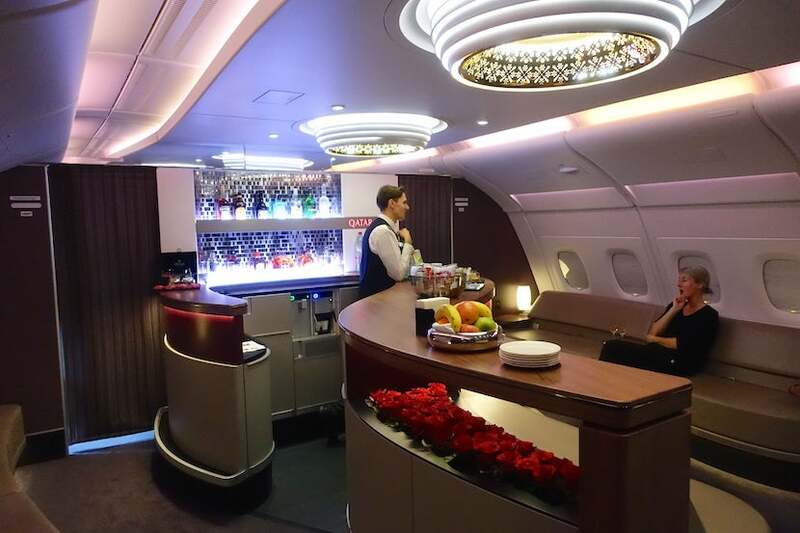 There’s a single, large business-class cabin on Qatar’s A380 with 48 seats right in the middle of the top deck between first class and the bar, behind which was a small economy cabin. 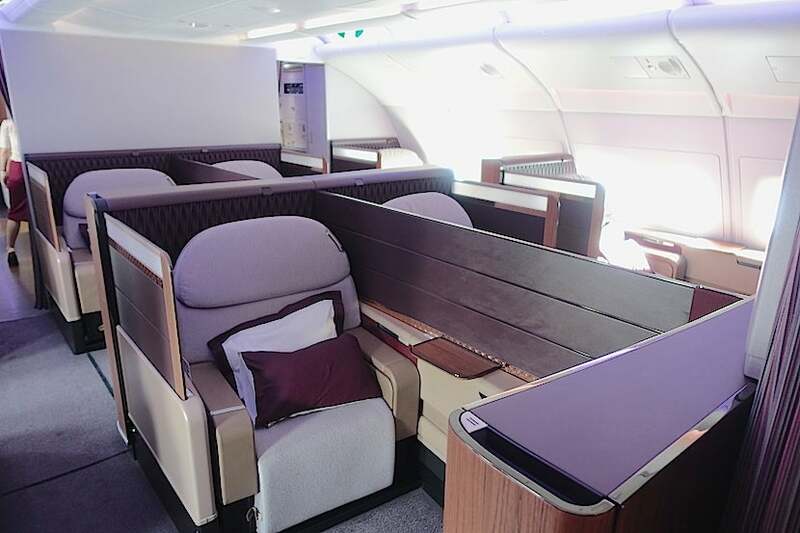 These were B/E Aerospace Super Diamond seats, like the ones American Airlines has on its 787-9s and retrofitted 777-200s and Virgin Australia has in its new “The Business” cabin. The seats were arranged in 12 slightly staggered rows of four seats across in the popular 1–2–1 reverse-herringbone layout. 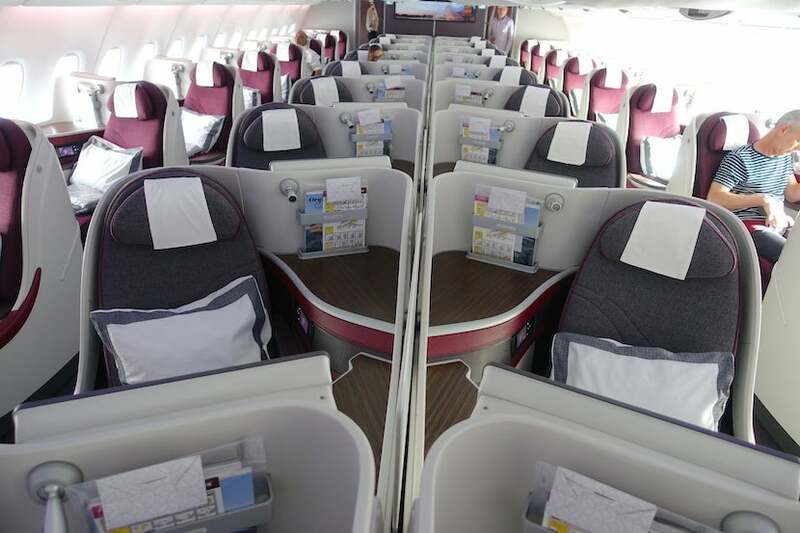 The seats along the sides of the plane angled out and were upholstered in burgundy, while those in the middle angled toward one another and were upholstered in gray. The side consoles had wood paneling. 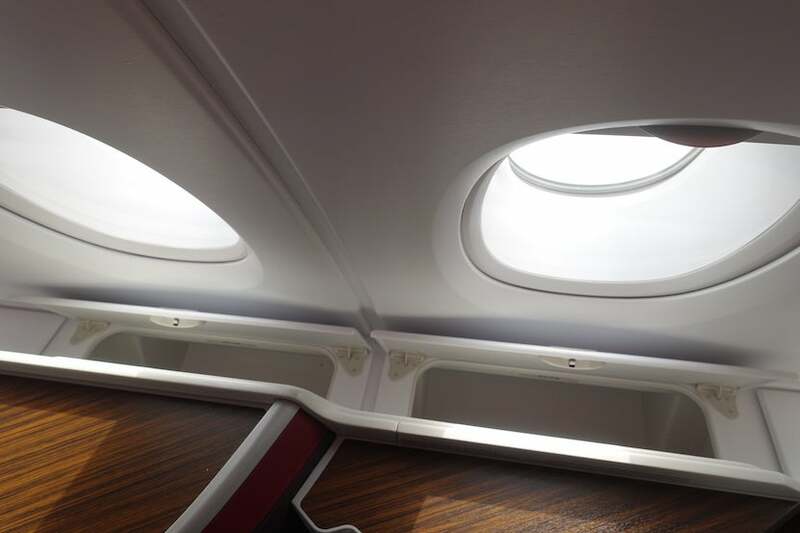 This particular business-class cabin felt especially airy and bright for a few reasons. 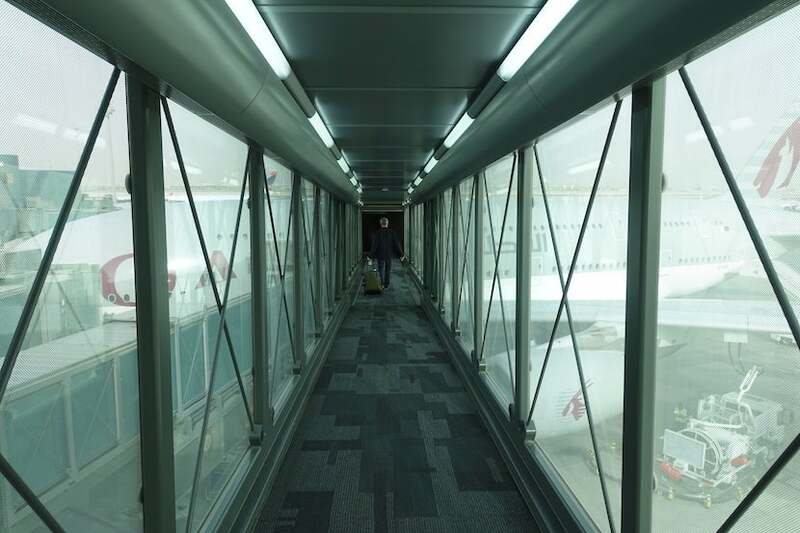 First, there was the A380’s size, which is enormous, even on the narrower top deck. Second, the seats’ shells were slim and their sidewalls didn’t block passengers off from the aisle. The look was streamlined and curvaceous, which lent the whole space a more open feel. The one major shortcoming of this cabin was that the overhead bins along the sides were not big enough for a common carry-on roller bag, so if you had one of those, you’d have to put it in the middle and hope the passengers underneath didn’t mind. You do get the added bonus of storage cubbies next to the wall if you were in the seats along the side of the plane. The seats themselves were pretty roomy at 22.2 inches wide — you could also lower one of the armrests for sleeping, which gave you 30 inches. The armrest was also where the headphones and a bottle of Evian were stowed. Each seat had about 50 inches of pitch but reclined into a bed that was 80 inches long. 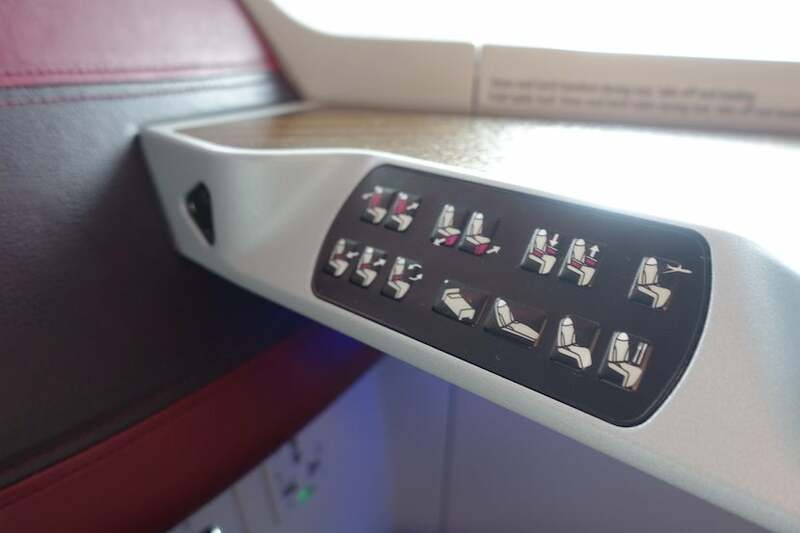 The seat was controlled by buttons along one of the side panels, with some pre-set positions that allowed you to move individual parts of the seat for various lounging positions. 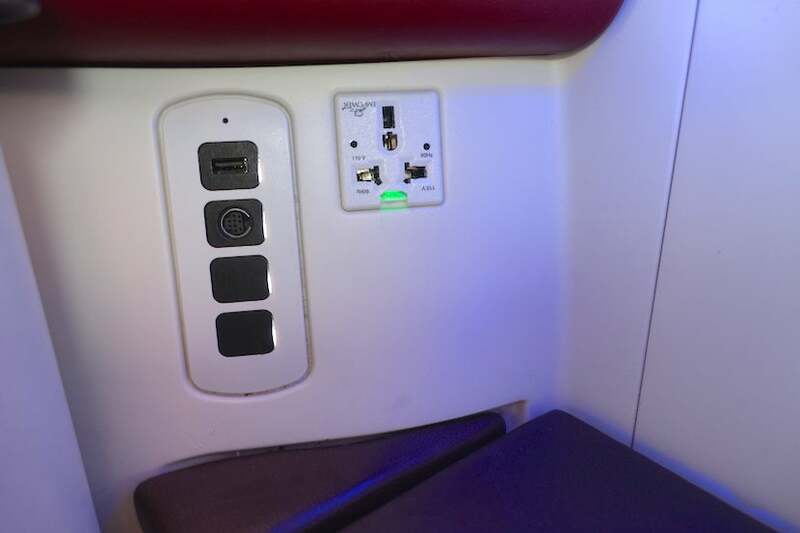 Below the button panel were a universal power port and USB port, in a good place for easy access right above a little cubby where you could easily stow a slim laptop or other electronic device. 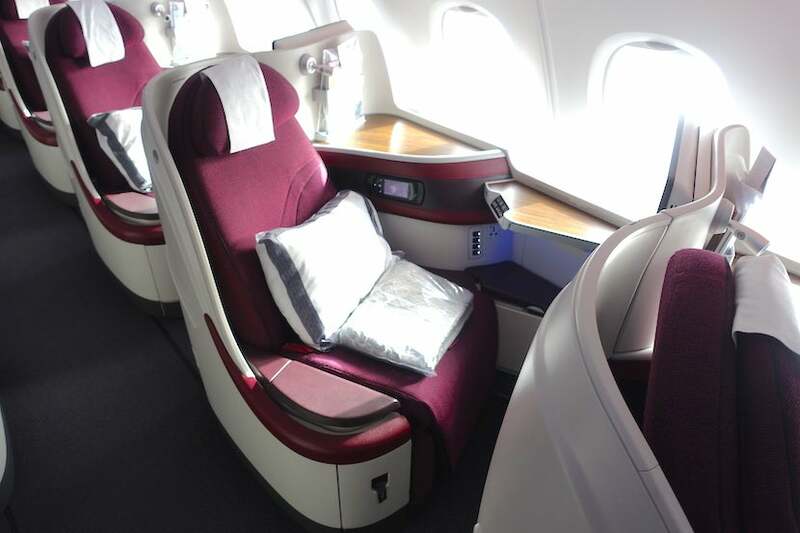 There were a couple of things about Qatar’s business-class seats I liked in particular. 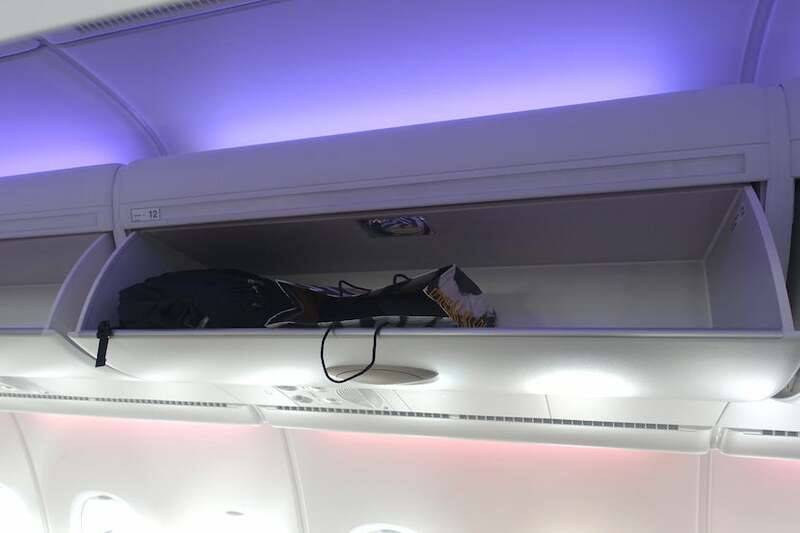 First, there was plenty of surface area, not to mention compartments to put your various belongings in so you didn’t have to keep getting up and going into the overhead bins during the flight. When you reclined the seat into a bed position, the foot rest became a footwell. Unlike on some other versions of this type of seat, the footwell didn’t have a ceiling to it, so its probably more comfortable for those with big feet. 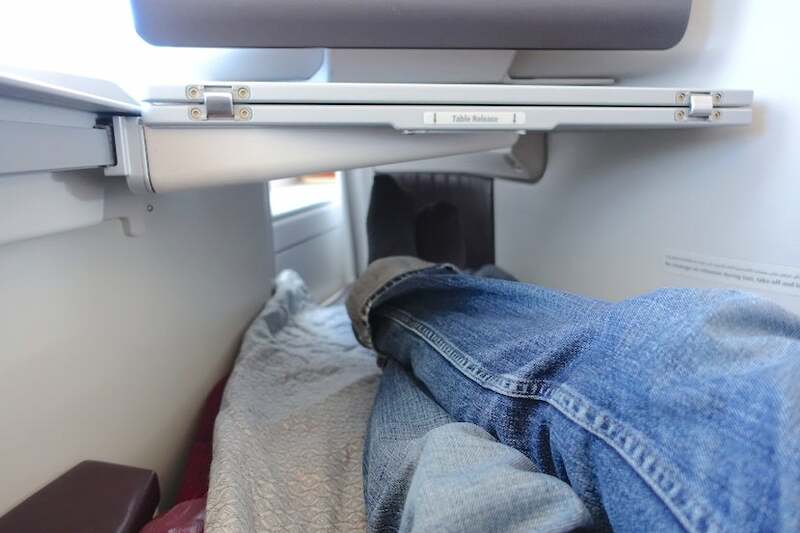 The tray table was also quite ergonomic. 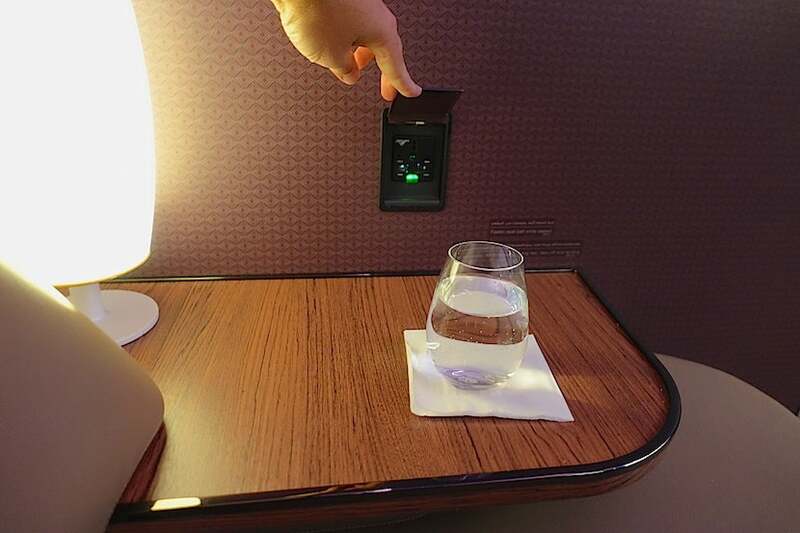 Rather than having to pull it out of the armrest or side of the seat, it was already in place beneath the in-flight entertainment screen. You could release a latch and slide it toward you to a position where it would be comfortable, or keep it folded up in half or flip it open for even more surface area. As I mentioned, the seats reclined into fully flat beds. Some people don’t like the lack of privacy in this particular version of the Super Diamond seat since there really isn’t anything separating you from the aisle, but it didn’t bother me. The airline provided medium-size pillows and light duvets for when you wanted to go to bed. Unfortunately, you’re only given pajamas on overnight flights. I do wish they’d also give you a seat cover or mattress pad as both would have made the seat more comfortable and given you a clean surface on which to sleep. Still, I found it comfy enough. 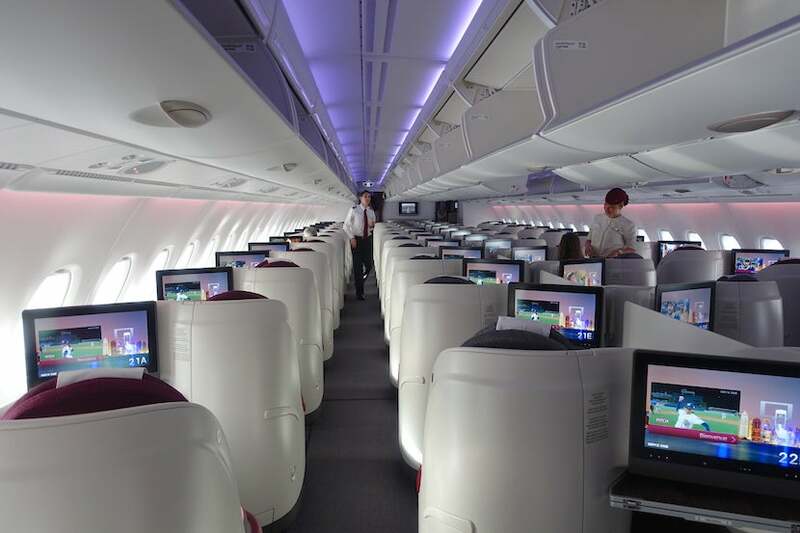 Each seat had a 17-inch monitor with the airline’s Oryx entertainment system, complete with movies, television shows, games and music. I thought the selection was quite good and the carrier claimed there were more than 3,000 entertainment options to choose from. 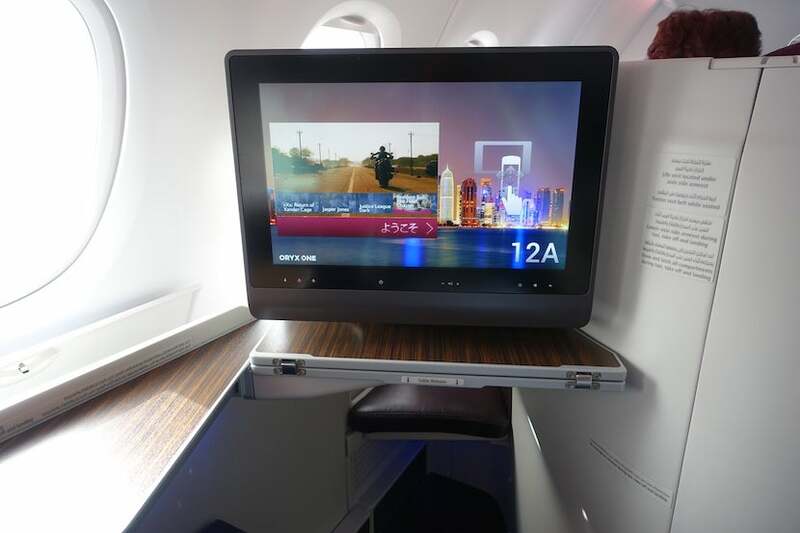 You could control the IFE either through the touchscreen or with a handheld remote that stowed in the side of the seat if you didn’t want to lean over to reach the screen. It was also nice being able to watch one thing on the remote while watching another on the main screen. For instance, I kept the flight information up and playing on my remote while watching programming on the larger monitor… except for takeoff and landing, that is. 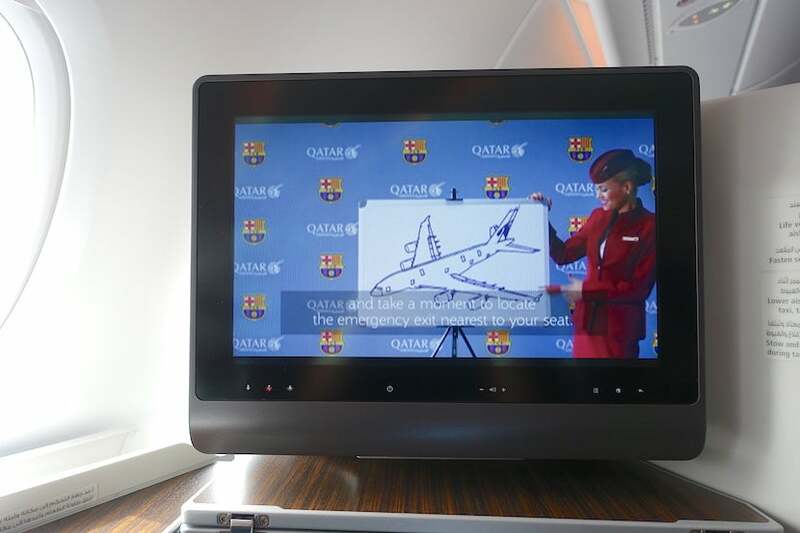 On a personal note, I enjoyed watching the airline safety video featuring FC Barcelona, which Qatar is a sponsor of. 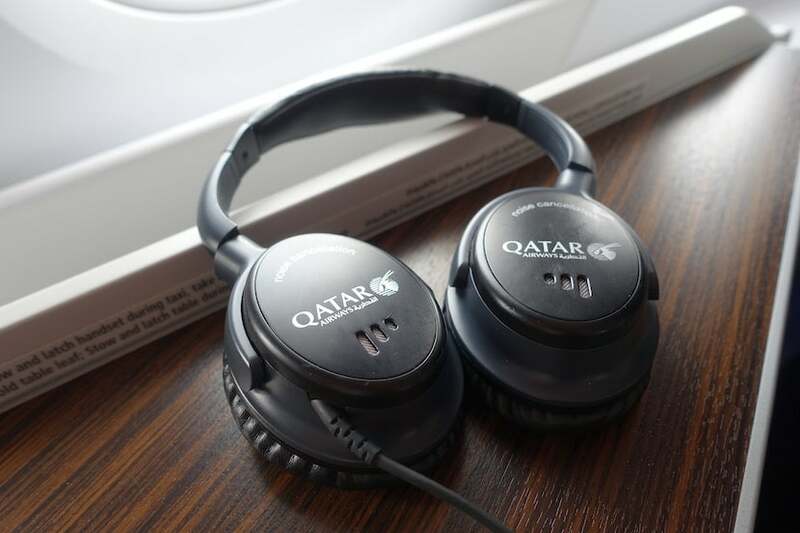 The airline provided noise-cancelling headphones, which were fine but nothing special. 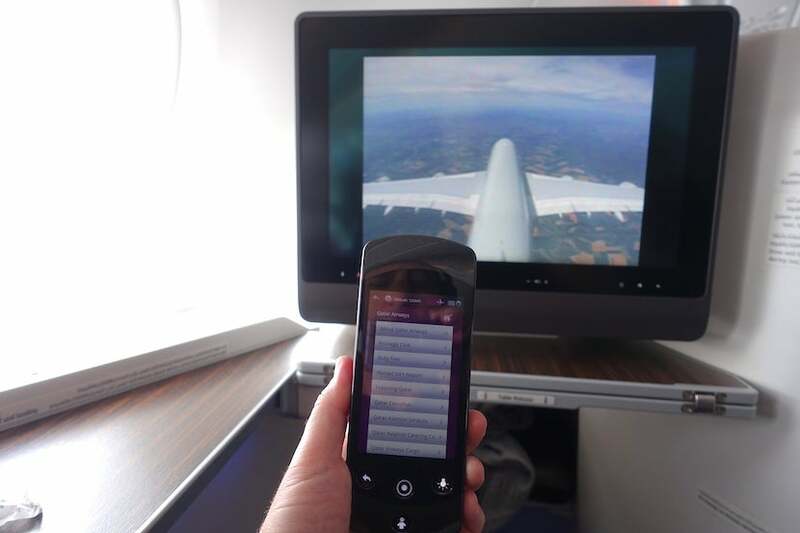 One of the most interesting things about this flight was how passengers received 15 minutes or 10 megabytes of free Wi-Fi, with the option to buy more expensive, larger packages of data. But when I tried to connect on both my iPhone and my MacBook at different times, I couldn’t get it to go past this screen on my phone — it wouldn’t even load on my computer. As a result, I was basically disconnected for the entire flight. 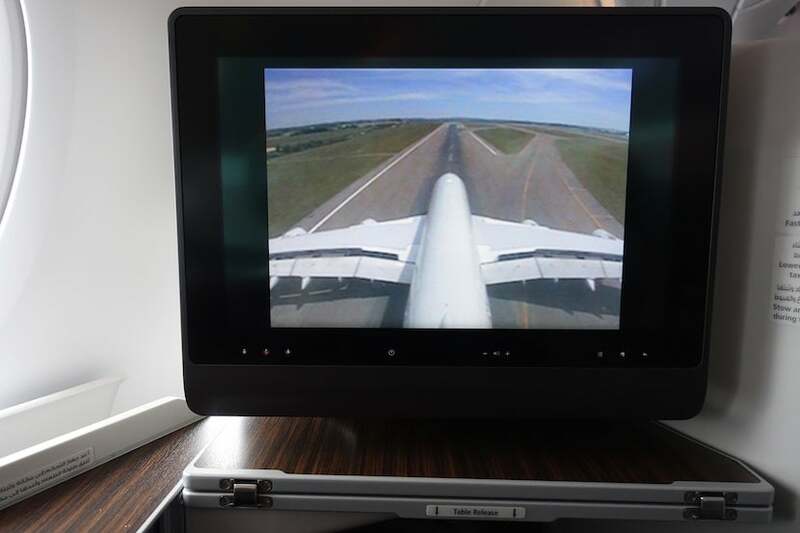 I suppose that’s why the purchase screen warned that connection speeds might not be up to on-the-ground standards, but if you are counting on using the internet during your flight, don’t. 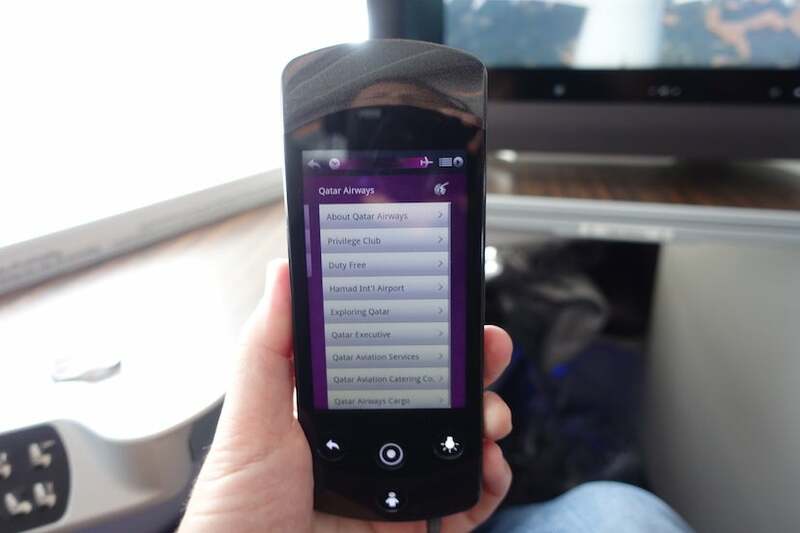 That said, I did manage to access it on a different Qatar flight, aboard the A350. 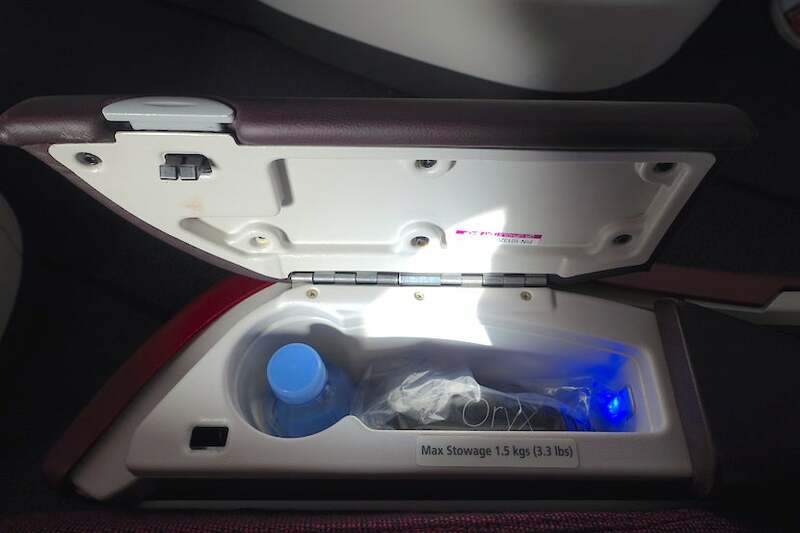 Not long after I was seated, a flight attendant brought by one of the airline’s newish BRIC’s amenity kits, which Qatar started using at the end of 2016. 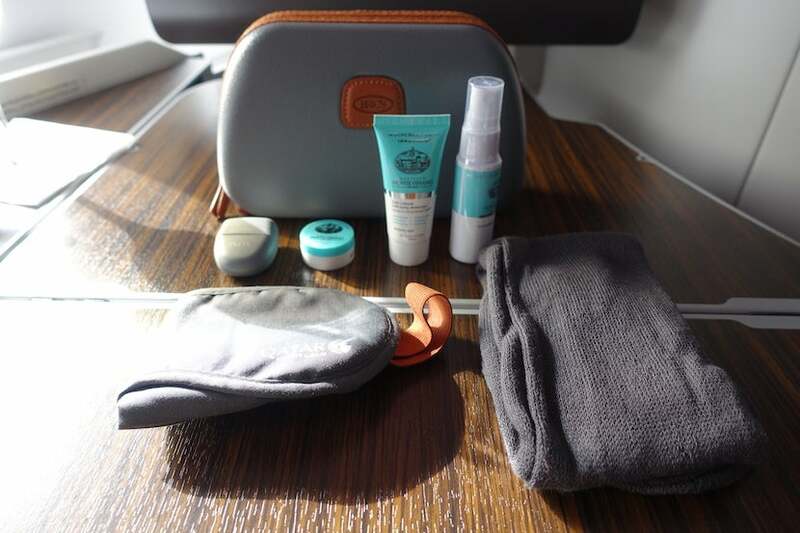 The semi-hard-sided cases contained an eye mask, socks, earplugs as well as Castello Monte Vibiano Vecchio hydrating facial mist, lip balm and anti-aging moisturizer. 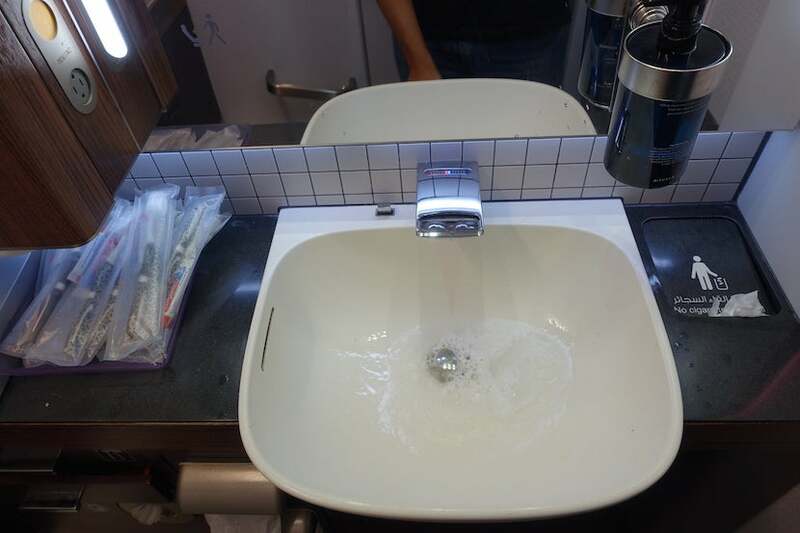 If you wanted a shaving kit or a toothbrush and toothpaste, you had to get them in the lavatories. Speaking of which, there were two lavs at the front of the cabin and another two between the cabin and the bar, so there was rarely a wait. 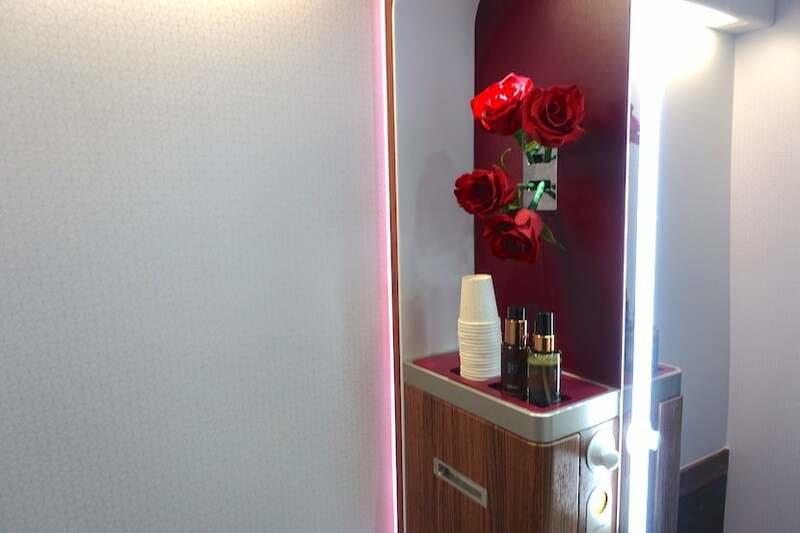 Flight attendants kept them quite clean, and there were other nice touches like fresh roses and Rituals products inside. My flight left Doha at 7:30am and landed in Paris at 1:35pm, so there was basically one meal service: brunch. The flight attendant in charge of my section was a friendly young woman from Kenya. Before takeoff, she came by offering orange juice, water or Champagne, then handed out menus for the flight. Shortly after takeoff, she came back through to take drink and meal orders and told me that I could eat at any point, but that the main meal service would take place about an hour after takeoff. I figured I would do that so I could maximize my time for resting and working later on. The menu started off with a choice of fresh orange juice, a date-cinnamon smoothie or a cucumber-apple-mint shot. 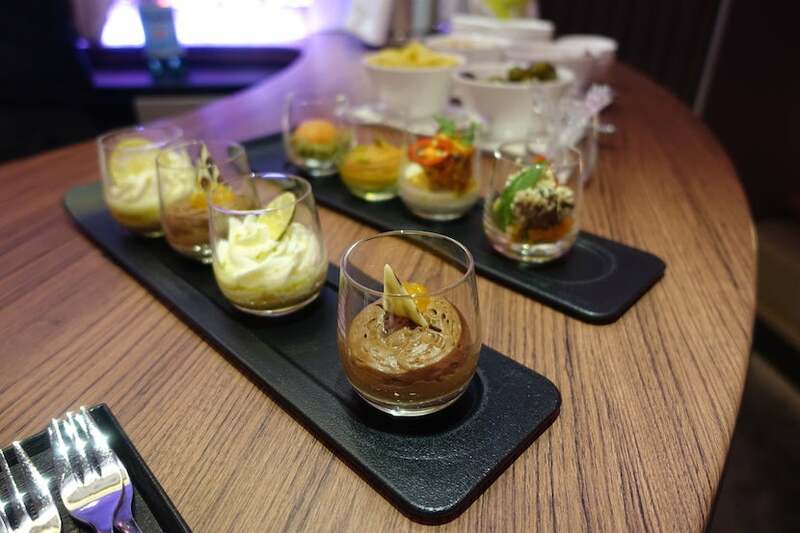 Among the appetizers were fresh fruit, breakfast cereals, Greek yogurt, muesli, and smoked turkey and beef with feta. 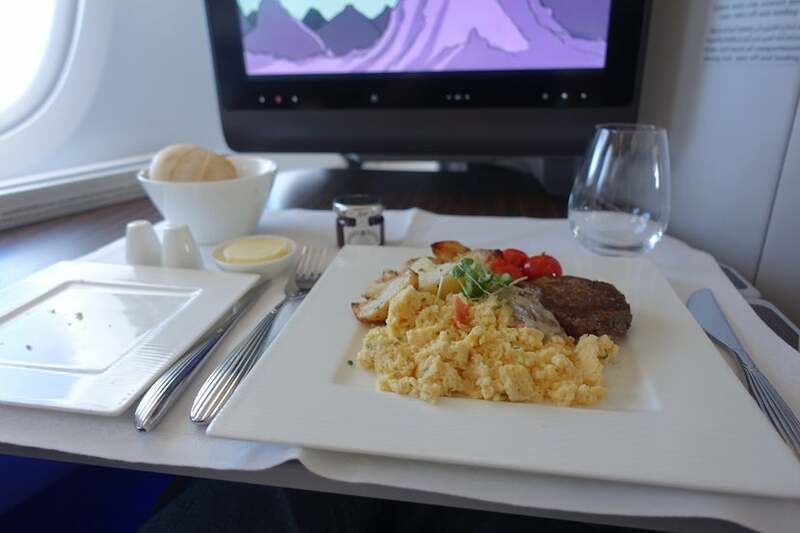 For the mains, you could have a traditional Arabic breakfast of feta, cucumber and tomato served with pita bread; lentil pancakes with paneer masala; or chive scrambled eggs with grilled beef, sautéed potatoes and roasted tomato. There were more lunch-y options like grilled octopus with enoki mushrooms and chive in a spicy sesame dressing (which was one of the Nobu options) or a simple linguine pomodoro and ricotta. I thought the airline’s wine list was decent, to say the least. 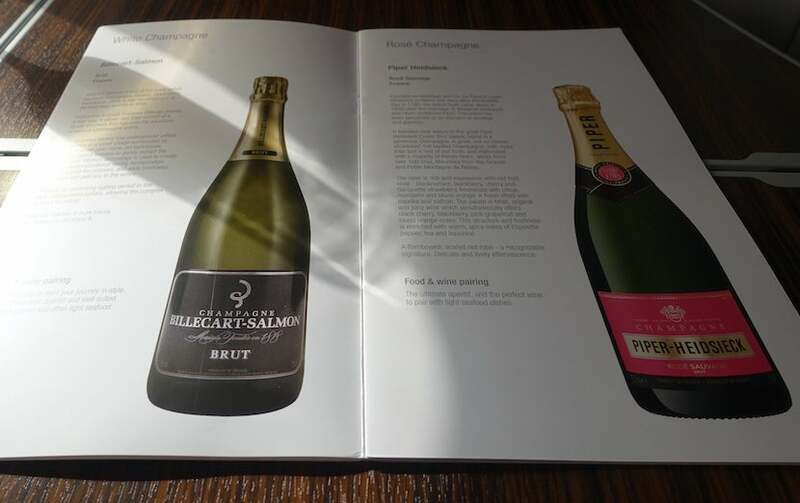 The white Champagne was Billecart-Salmon Brut, while the rosé was Piper-Heidsieck. There was a lovely Villa Maria Sauvignon Blanc from New Zealand and Altano red wine from Portugal’s Douro Valley, among the other choices. There were also various juices, mocktails, sodas and still or sparkling water to choose from. The airline served a selection of about a half-dozen Dilmah teas and various coffee drinks including cappuccino and macchiato. One quick negative note: Although the service was friendly and efficient overall, I think the cabin size and the successive courses meant flight attendants just couldn’t get meal service done in a timely manner on this jet in particular. Meal service did indeed start about an hour after takeoff, but no one came by offering even a glass of water until then. Likewise, once you placed your order, it took quite a while to get it and then another good chunk of time before the FAs came back through to clear it. I’m glad I opted to skip the breakfast starter options and just go right for the steak and eggs so I could eat quickly and be done with it. I also thought the bar was a godsend for this reason. I retreated to it as soon as I was done eating so the flight attendants would get the idea and clear my plates. 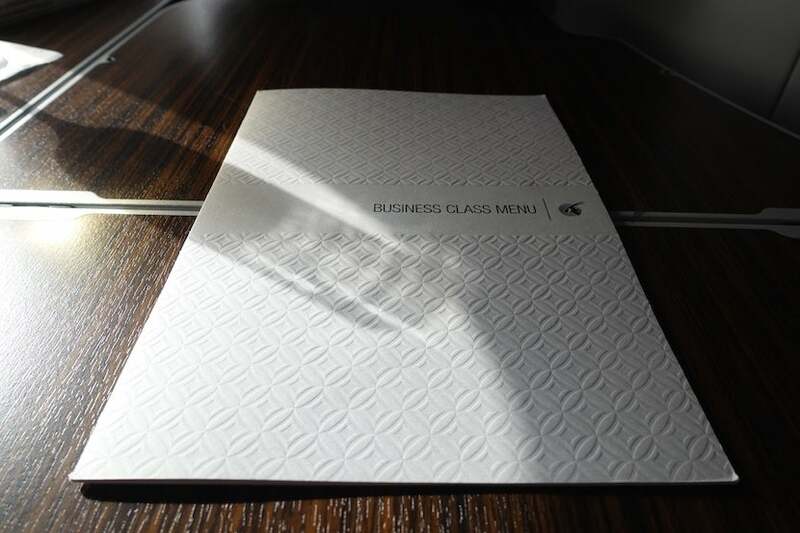 The bar was located behind the business-class cabin and was accessible to passengers there and from first class. 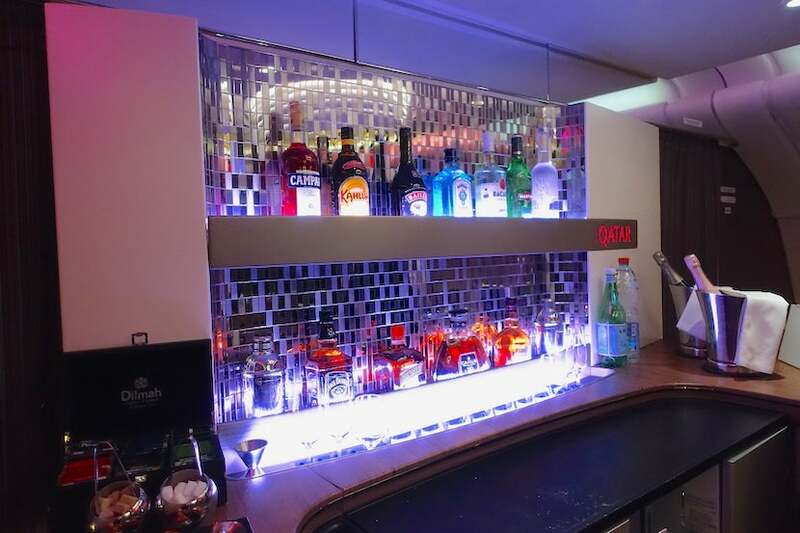 It was probably the biggest onboard bar I’d ever been in, with banquettes along either side of the cabin and a large bar top, as well as eye-catching backsplash. The banquettes had power plugs if you wanted to come back here to get some work done. The flight attendant manning the bar was super friendly and happy to mix up any variety of cocktails, though I just opted for a glass of Pellegrino after takeoff and before meal service began, then a glass of Champagne later on in the flight. 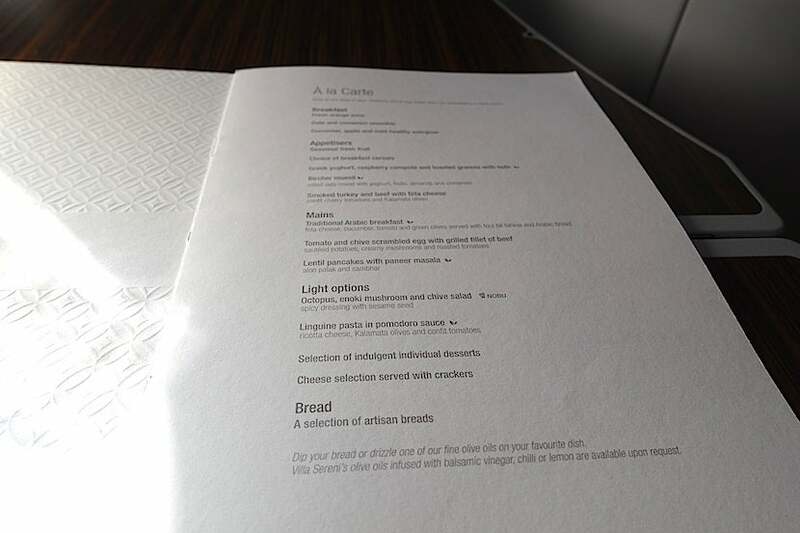 Here’s one other thing to note: Although it was once a frequent-flier secret that you could come back here for a glass of Krug, which they typically serve in first class but not business class, it looks like those days are over: It was only Billecart-Salmon Brut and Lanson rosé here. 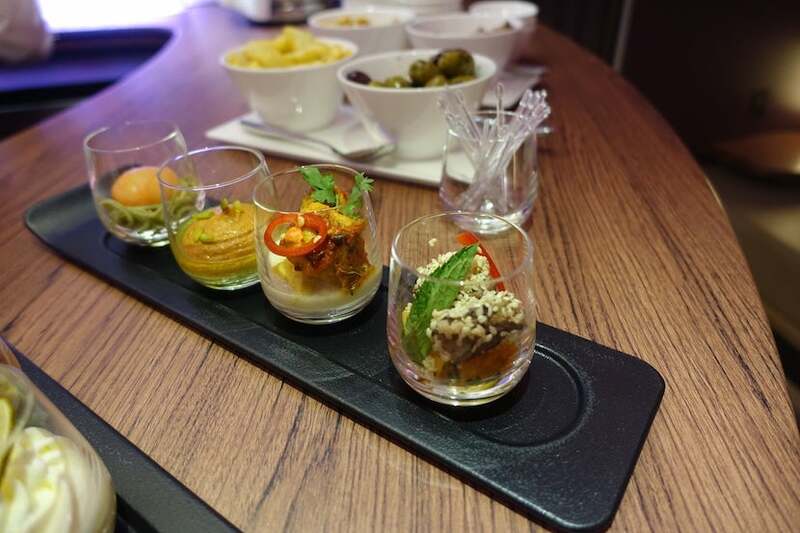 There were also savory nibbles. Dessert bites like chocolate mousse and lemon custard were offered as well. Still, it was nice to have somewhere to go beyond your own seat, and to be able to get up and get a drink whenever you wanted without having to deal with the hustle and bustle of the galley. I even took a turn behind the bar myself! Sure enough, when I got back to my seat, my table had been cleared and a new bottle of water was waiting on the console. 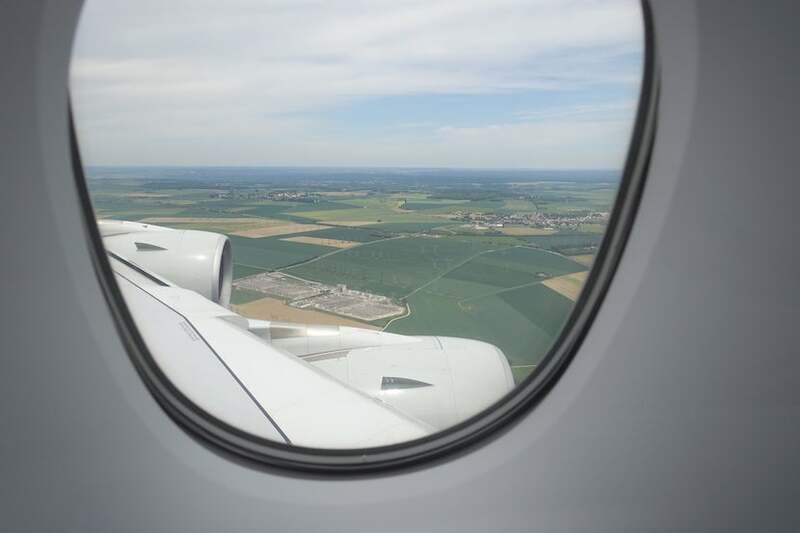 I ended up taking a nap; the A380 was such a quiet, smooth ride, I woke up just about an hour before we landed. There wasn’t a second meal service, but you could still have a cold-cut plate if you wanted. I decided to skip it and just have a cup of coffee with some cookies and to freshen up before we landed. 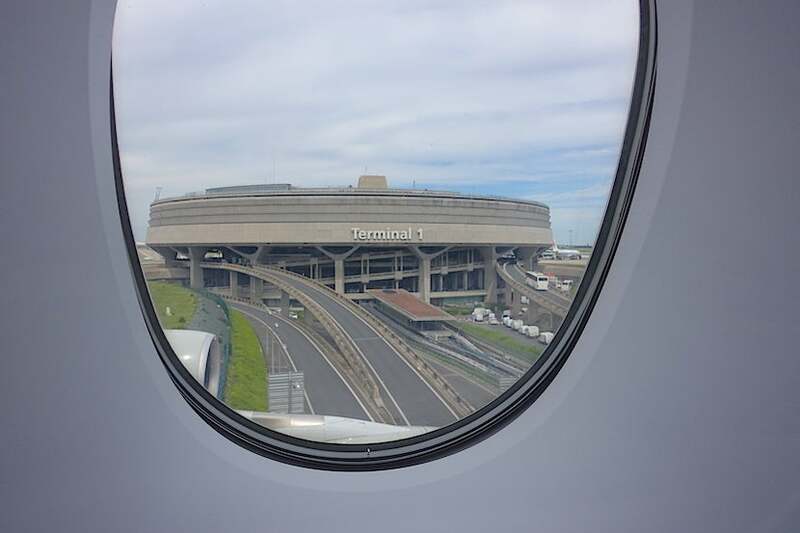 We arrived in Paris right on time and taxied to the gate in Terminal 1 — you know, the circular Space Age-y one. I was out and through customs and immigration within minutes. 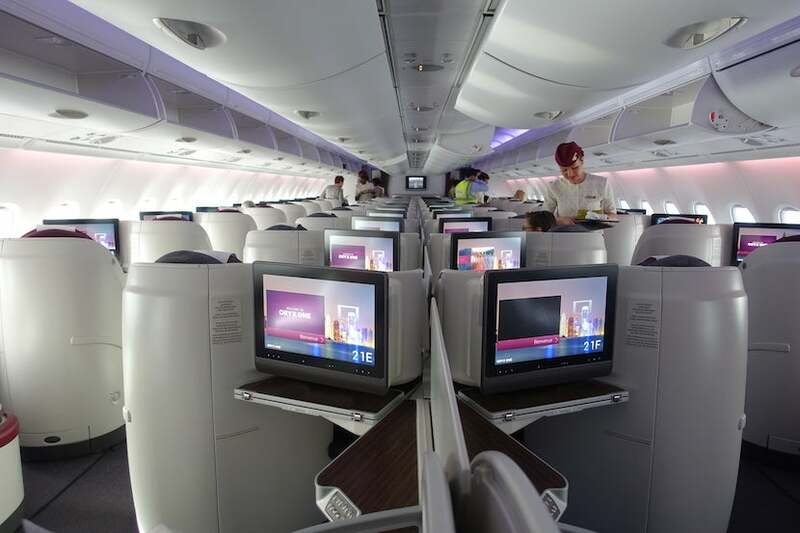 Qatar Airways’ business class has won several awards and is roundly acknowledged to be among the best in the world. 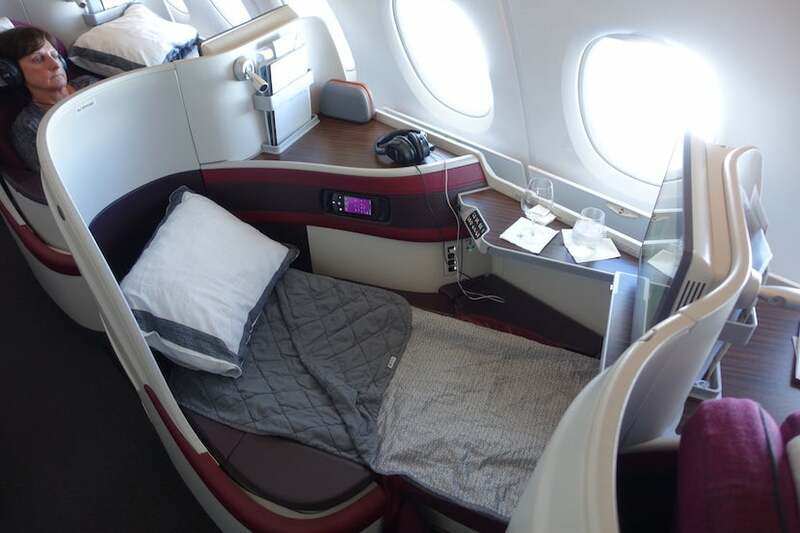 The new QSuites look like they’ll continue that legacy, the seats and the experience aboard the A380 do not disappoint. 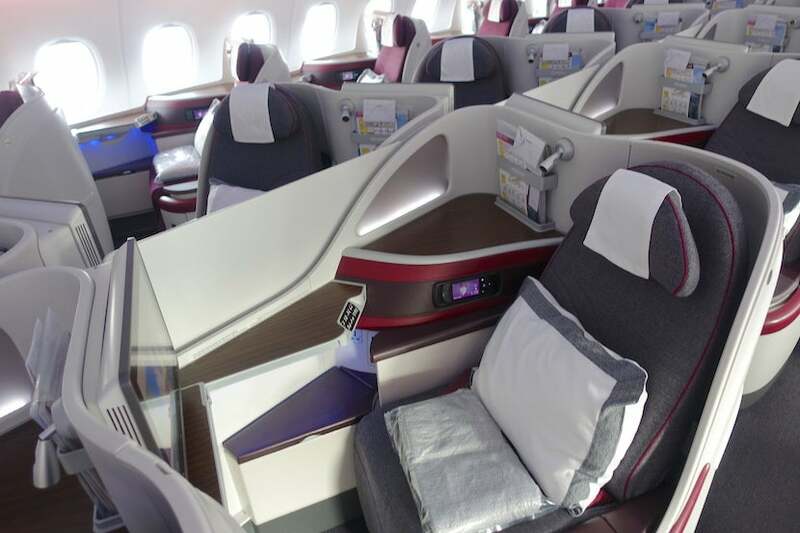 The seats are comfortable, ergonomic and still feel cutting-edge. They have plenty of storage space and great technological touches, including the entertainment system, if not the Wi-Fi. The food Qatar was good, as usual, though the service could be a bit slow at times — all flight attendants were friendly and engaging, so it wasn’t a major complaint. 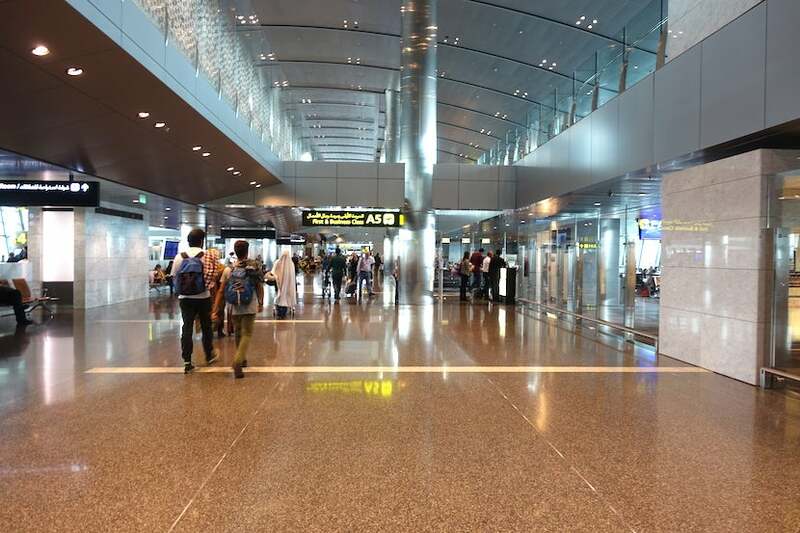 Thanks to the bar, I never went hungry or thirsty, and I thought my eight-hour flight had just the right mix of working, eating, entertainment and resting. 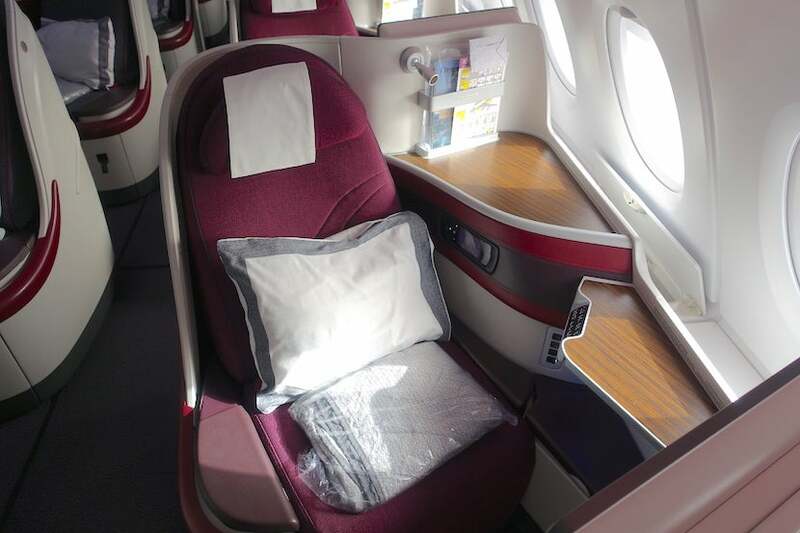 Have you flown in business class aboard Qatar Airways’ A380? Tell us about your experience, below.